Tonight on TV – living legend Mark E Smith (MES) – what more can I add? 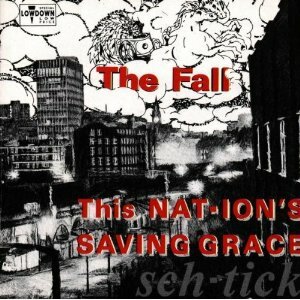 I first saw The Fall in September 1977 when I was a student in Manchester. I though I was watching The Velvet Underground. There they were, dressed in black, barely moving on stage – MES with his back to the audience the whole time blasting out their repetitive riffs – it was awesome. The memory is raw even after 33 years! You know I have lived abroad before – back in the 80’s and I swear I had to come home just to see The Fall. I even went to see them on my 50th birthday. And they played a song called 50 Year Old Man. Cute. And I am also delighted that the other music legend – without whom yada yada yada – the late and sadly lamented John Peel was also a massive fan (even though I got there first – natch). If anyone wants to come round my house for a Fall fest they are welcome – even though There’s a Ghost in Ma House. I could go on. And on. And on. But you’ll be pleased to know it’s just starting – gotta go. Hang on, wassup? What’s B doing? Ultimate What???? Musht be shum mishtake.